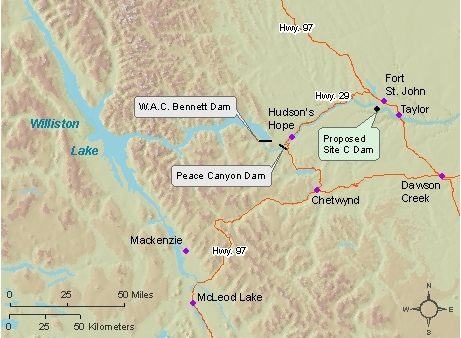 The Peace River in northern British Columbia is currently being considered for a major hydro-electric project at Site C, near Fort St. John. The river has already been dammed twice. Another dam raises many potential questions about social and environmental effects. How does the environmental and social history of the river inform the current debate? What environmental changes will a dam introduce? What are the possible social and economic effects? Are there alternatives to secure BC’s future electricity needs? NiCHE has archived three presentations from this event. The Peace River in northern British Columbia is currently being considered for a major hydro-electric project at Site C, near Fort St. John. The river has already been dammed twice. Another dam raises many potential questions about social and environmental effects. Citation: Hirt, Paul. “On System Evolution of Electric Power Generation.” Considering Site C.
Citation: Loo, Tina. “Towards an Environmental History of Progress.” Considering Site C.
Citation: Mouat, Jeremy. “On the Columbia River Treaty” Considering Site C.